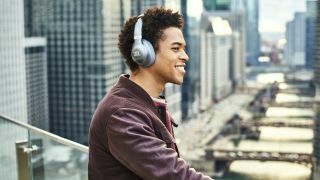 JBL has announced the launch of its new Everest GA wireless headphones range, all of which is optimized for Google Assistant. In other words, you can have easy access to the world’s biggest search engine without so much as lifting a finger. Announced at IFA 2018, the range includes the new 710GA over-ear headphones, combining JBL’s long audio heritage with intuitive voice activation technology from Google, which can be activated by using touch sensors on the earcup. This means you can send texts, make calls, and most importantly, control your music without missing a beat. According to JBL, two hours of charging time will provide you with over 24 hours of music, making the 710GAs a great choice for busy commuters, long distance travelers, and those of us who are a little forgetful when it comes to charging our devices. They also come with JBL’s ShareMe 2.0 feature, which allows you to pair with any other compatible Bluetooth headphones, meaning you can share your music with your friends wirelessly and listen together without cumbersome wires. Also in the Everest GA range are the 110GA in-ear wireless headphones, which come in three different sizes for a snug fit and improved comfort. The 110GA’s come with eight hours of playback from a two hour charge, and are also optimized for Google Assistant. JBL are yet to confirm the availability of the new range, however prices have been released, with the 710GAs coming in at around $300 (£230 / $400) and the 110GAs priced at around $120 (£90 / AU$160).